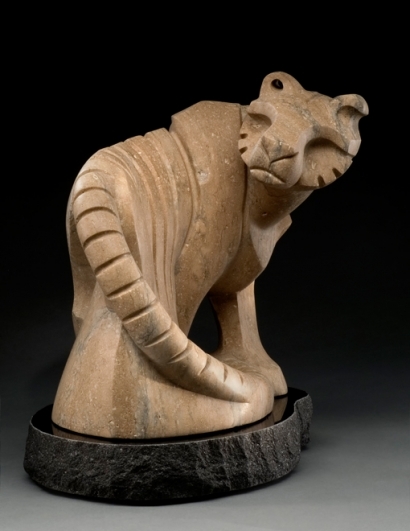 “Save the Tiger” is another stone sculpture in my series on endangered species. February, 2010, marks the beginning of the Year of the Tiger on the Chinese calendar. This creates a demand for tiger skins and tiger parts. The killing of tigers in the wild has increased as a result of this demand. 10 % of the proceeds from the sale of “Save the Tiger” will be donated to Panthera to help save the rapidly decreasing wild populations of tigers. It is tragic that the extinction of tigers could happen in our lifetime. I want to do what I can to keep them part of our world. The design for “Save the Tiger” was an interesting challenge for me. Usually I design my sculptures first as drawings. Then I make a clay maquette if the design is complicated with twists and body parts overlapping. I began the tiger with a drawing. Then I went to clay, but was disappointed with the 3-D realization of the drawing. I made many different versions of the clay maquette until finally finding this design. The tiger is ambiguous. Is he emerging from the stone or being engulfed by the stone? The sculpture stands as a metaphor. Will the tiger survive human predation or be lost forever? The stone is Dolomitic Limestone, quarried in Ontario, Canada. It is a hard limestone, a rich milk chocolate brown with thin black stripes and few vugs. The hardness comes from magnesium sulfate (I think) which has invaded and replaced some of the limestone. It carves beautifully. The stone was really fun to carve as it is the stone of choice of one of my mentors, Madeline Wiener. She and her crew are making gigantic sculptures from this stone at our shared studio-warehouse space in Denver. It is a beautiful stone when finished, and I was very curious to have the experience of carving it. I work in the presence of many wonderful, enormous “Bench People” made by Madeline from this delicious-looking stone.